LATEST! Course completed and written up in RotorTorque - see here. 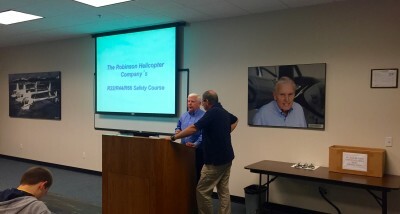 Paddy & Sarah are in Torrance, Los Angeles, California for the Robinson Safety Course this week timed to coincide with the imminent launch of our pilot certification scheme. This is a valuable 3/4 day technical course with a mixture of ground school and flying. The courses are now held all over the world including, more recently, in the UK at HQ Aviation. Obviously, at their head office, we have the chance to do a full tour of the factory (see picture). Kurt Robinson, who introduced the course (with a fascinating introduction by the way), mentioned a new R44 - the R44 Cadet - which RHC will announce officially in the coming weeks. This will be a 2 seater R44, 200lbs lighter, a lower VNE of 110 knots and cheaper than a Raven I. The space freed up by removing the 2 rear seats will give this new helicopter plenty of needed cargo space. The first machine will roll off the production line in Q1 2016. The R66 has just been approved (last week as we write) for use in snow by the FAA having gone through a whole raft of tests up in Canada in low visibility snow conditions. Robinson have been keen to get a diesel engine in their helicopters and are continuously kooking at options. The diesel engine would have better high altitude performance and would be able to run on the more ubiquitous Jet A1 fuel. Kurt reckoned this was 2 or 3 years away, as is electronic ignition. Sales of all helicopters are going through a slow patch due to the strong dollar, however RHC still produce - per week - around 2 R66’s, 5 R44’s and 1 R22. These figures do include rebuilds, however.